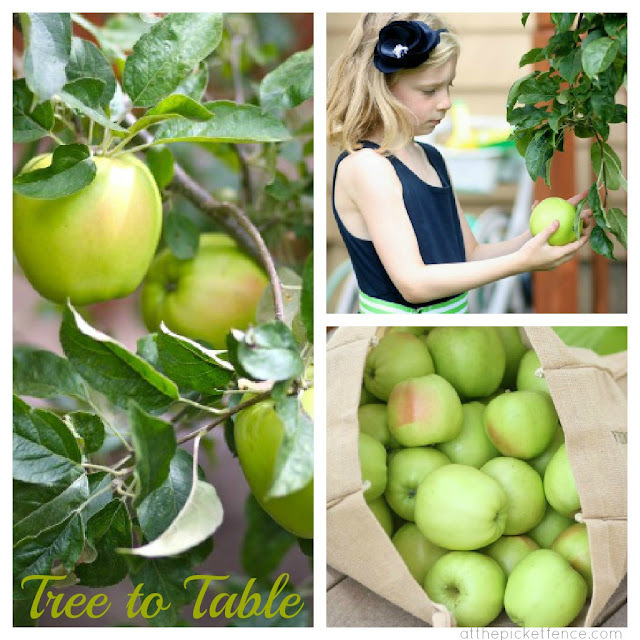 Today we’re going apple picking and sharing some great apple picking recipes…as we go from…. I have a thing for apple trees! Even the tables at our New England fall wedding were each named after apple trees. I’ve been known to tear up when reading The Giving Tree to our kids and our favorite family photos were taken among trees at a local orchard. When we bought our house we discovered that the previous owners had planted their own giving trees in our yard, within picking distance of our back deck. Each fall we’ve marveled at and celebrated our backyard bounty and have accumulated recipes that highlight each fruit. This year we sadly say goodbye to our beloved apple, who lost a valiant fight during a heavy windstorm. To commemorate our final harvest, I documented our little trees’ offerings & the recipes that highlight them best. All of these recipes are incredibly easy and work beautifully with store bought fruit. The moist cake is studded with apples & drizzled with a cider glaze. You won’t even have to get your mixer out for this recipe and I guarantee you’ll be fighting over the last piece. Preheat oven to 350° F. Using 1 tablespoon oil, grease a tube pan or two mini loaf pans measuring 5 ¾ x 3 x 2 ½ inches. In a medium bowl, sift together flour, salt, baking powder, baking soda, and cinnamon and set aside. In a large bowl, blend sugar and remaining 1 cup of oil. Add eggs and milk and beat until well combined. Add reserved dry ingredients to sugar mixture and stir until just blended. Fold in apples. Makes a very thick batter. Press batter evenly into prepared pan(s) and bake for 50 to 60 minutes or until a toothpick inserted into the center comes out clean. Let cool in pan for 10 minutes. Invert pan, place serving plate on top and turn out cake. In a saucepan, simmer apple cider over medium heat until reduced by half, about 10-15 minutes. Add powdered sugar to cider and stir. Remove pan from heat and whisk in melted butter. Cool slightly then pour over cake. Ina Garten’s French apple tart can be assembled in minutes using frozen puff pastry (I’ve also used frozen pie crust) and the results are so rewarding. So little effort for so much taste. The steps are easy enough that my 5 year old mastered it. 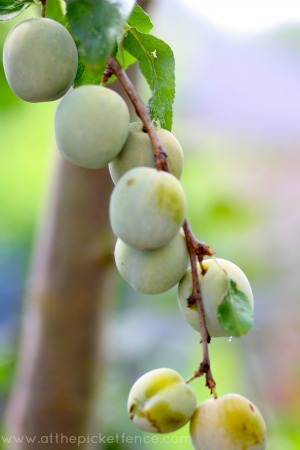 We are treating our plum tree as a greengage plum, though we are not entirely sure that this is correct. Regardless, this stovetop plum jam was delicious and requires no pectin as plums have it naturally. It pairs nicely with a slice of aged cheddar. The perfect accompaniment to a homemade spread is some crusty artisan bread. The hardest part of this no-knead recipe is remembering to mix the 4 ingredients the night before. Your house will smell divine and you can fool everyone with your baking skills. Don’t tell my family how easy this is…they pretty much think I’m a baking superstar whenever I make it! 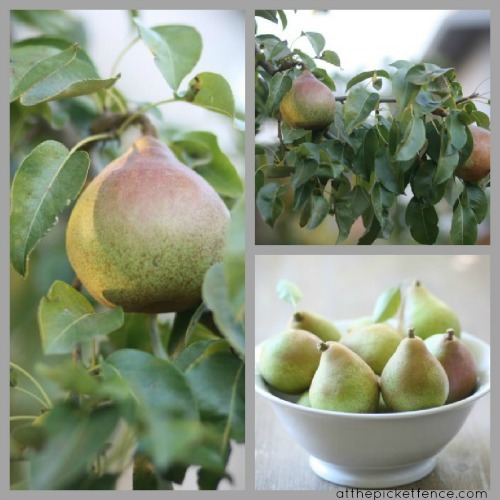 Our pear tree has taught us a lesson in delayed gratification. Apparently our pear variety needs to be in cold storage for about a month after harvesting. After the month’s wait, they rest on our counter for up to a week to reach optimal ripeness. Last year’s crop was delicious so we patiently await these babies to emerge from their month’s hibernation. 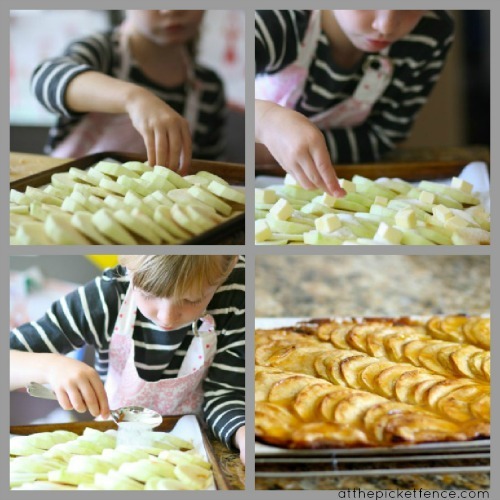 Once they are ready, a few will enjoy a starring role in Ina Garten’s Apple & Pear Crisp. Ina hasn’t failed me yet so I know the results will be worth the wait! Thanks for meeting me at the fence today & have fun savoring the season of Fall! 2 cups (about 2 large) tart apples, peeled, cored, and cut into ½ inch dicePreheat oven to 350° F. Using 1 tablespoon oil, grease a tube pan or two mini loaf pans measuring 5 ¾ x 3 x 2 ½ inches. In a medium bowl, sift together flour, salt, baking powder, baking soda, and cinnamon and set aside. In a large bowl, blend sugar and remaining 1 cup of oil. Add eggs and milk and beat until well combined. Add reserved dry ingredients to sugar mixture and stir until just blended. Fold in apples. Makes a very thick batter. Press batter evenly into prepared pan(s) and bake for 50 to 60 minutes or until a toothpick inserted into the center comes out clean. Let cool in pan for 10 minutes. Invert pan, place serving plate on top and turn out cake. 19 Comments on "Apple Picking Recipes…from Tree to Table"
That looks great. I love your new look. I can’t wait to talk to you about how you like WP. We are stuck in the house for the next few days riding out the storm. BTW you still showed up on my sidebar. I have to make sure you stay there, but I didn’t re-add you and it was still there this morning. Hi Julie. My goodness this is a delicious post…everything from the photography, to the food and recipes is so appealing. I can’t wait to try to the no knead bread. Thank you for sharing. These apple and pear photos are stunning! 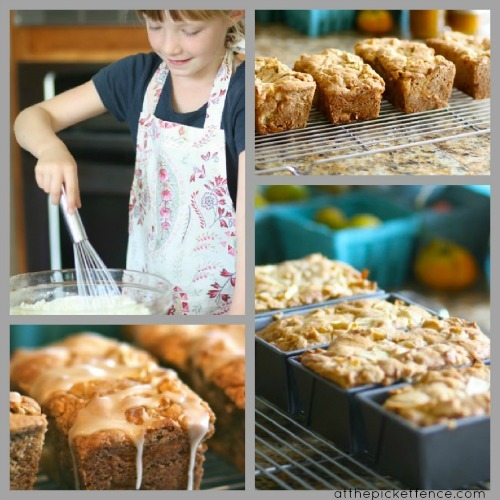 I can’t wait to try the apple cake recipe from Carolyne Roehme! Heather and Vanessa, your new WordPress home looks beautiful! So happy for you and glad to hear the “move went so well! Yeah!!! Everything looks so yummy that my mouth is watering! Thanks for the recipes. Julie, I want to come over right now!! 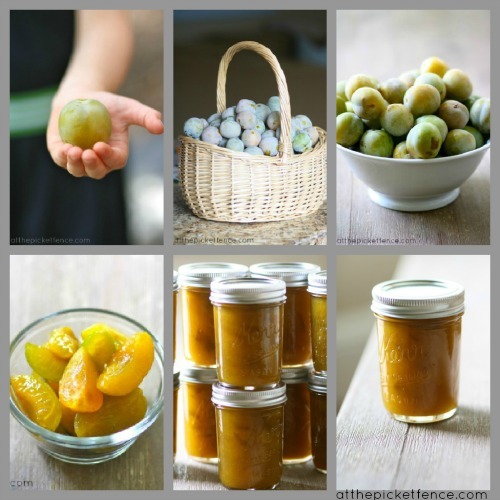 Love this post and the recipes…and now wishing I had some fruit trees in my yard 🙂 You are amazing! What a beautiful post…such wonderful recipes to make … I am definitely going to try the French Apple Tart recipe…looks great and sounds easy to make…I love easy! !….Gorgeous photography!! !….and congrats on the smooth transition to WordPress!!…. Lovely post … beautiful photos. I too would like to have the link to the apple loaf recipe please. I did go into Carolyn’s site but was unable to find it. Simply delicious post! What gorgeous yummy pics! Have been unsuccessful in viewing and printing the recipe for the apple cake – looks delicious. It’s Inspiration Friday No. 88! Welcome!